Florent Schmitt’s Légende, Op. 66 is one of the most compelling concertante pieces ever written for the saxophone. Composed in 1918, it’s a work that exists in versions for saxophone, viola and violin soloist, along with orchestral or piano accompaniment. Simply put, it’s an unforgettable piece of music: Within the span of just ten minutes, Schmitt presents a rhapsodic ballad that is amazing in its breadth and depth of atmosphere, with a masterfully colorful orchestration coexisting with the solo saxophone. I characterize the music as remindful of an unsettled, fitful dream … and I also hear more than a little of the “orientalisms” that were common in Schmitt’s scores of the period. Over the years I’ve heard many performances of the Légende – and in every combination of instruments. To my mind, the most effective version is the one for saxophone and orchestra. Recently, a singularly fine performance of the Légende was uploaded on YouTube that features saxophonist Christopher Bartz performing with the USC Thornton Symphony. Saxophonist Christopher Bartz: His fine performance of Florent Schmitt’s Légende is on YouTube. I find myself particularly drawn to this performance because of Mr. Bartz’s moving — even mesmerizing — interpretation. To my ears, he gets to the heart and soul of this music in a way few others have done. I was curious to learn how Mr. Bartz came to know the Légende and to make it part of his repertoire — and in the process of my research discovered that he won a concerto competition playing this very piece. Mr. Bartz was kind enough to share his thoughts about the music with me. PLN: When did you first come to know the music of Florent Schmitt? CB: I discovered Florent Schmitt on Arno Bornkamp’s “Saxophone Sonatas” recording. Bornkamp’s album was one of the first classical saxophone recordings I ever heard. On it, he plays Schmitt’s Légende wonderfully. 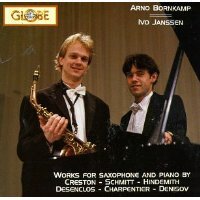 Early inspiration: Arno Bornkamp’s “Saxophone Sonatas” album. That CD was given to me when I was about 15 years old. I remember being especially drawn to this particular piece, listening to it over and over. 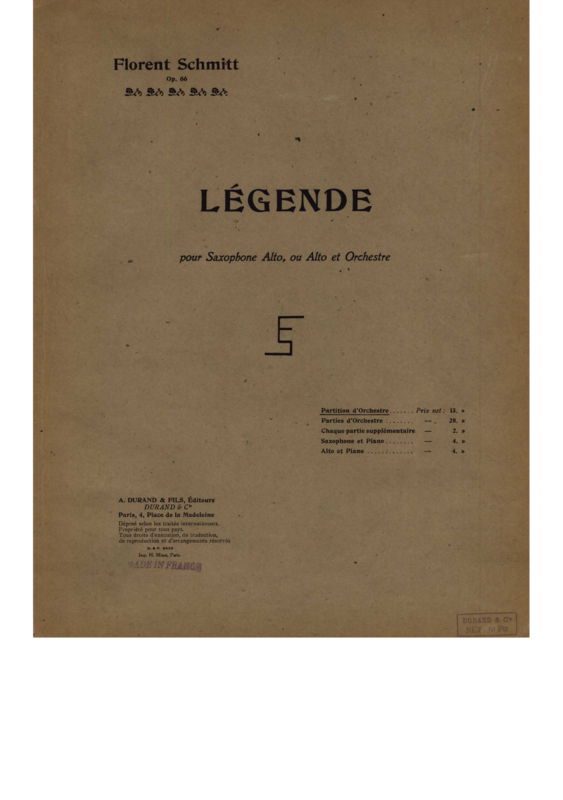 PLN: When did you start studying and performing the Légende? CB: I got hold of the sheet music when I was in high school. I listened to the music many times while following along with the score. I spent a great deal of time dissecting and absorbing the music before I ever played a note of it, in fact. As an undergraduate saxophone student in college, I finally felt I was ready to tackle the demanding ensemble preparation needed to perform the piece. I rehearsed it with a pianist a few times but never actually performed it publicly. I played the piece as part of the University of Southern California’s annual Concerto Competition. As a winner of that competition, I had the wonderful opportunity to perform it in concert with Sharon Lavery directing the USC Thornton Symphony. I’ve had the chance to present the piece a few times since, with piano accompaniment. PLN: What attracted you to the music, and what aspects of it are particularly memorable or moving? CB: Most impressive are the magnificent colors the composer draws from the orchestra. Also, the beautiful melodic lines in the saxophone part, which vacillate between calmness and overwhelming bursts of emotion. I really appreciate the way Schmitt treats the saxophone as a soloist in partnership with the orchestra; the interplay between the two is uniquely special. My favorite moment in the piece is the saxophone flourish right at the very end. PLN: How would you rate the Légende compared to other concertante music for the saxophone? CB: Without a doubt, it’s one of the best works ever composed for the saxophone. I’m very thankful to have it in my repertoire! PLN: Tell us more about the various music competitions you have entered. CB: In addition to winning the USC Concerto Competition, I was named the Grand Prize Winner of the 2012 Hennings-Fischer Young Artists Competition. I played the Heitor Villa-Lobos Fantasia for Soprano Saxophone & Chamber Orchestra for that competition. As the competition’s winner, I was very fortunate to have the opportunity to play the Hindemith with Steven Kerstein and the Burbank Philharmonic Orchestra. More recently, I was awarded Third Prize in the 2013 Music Teachers National Association (MTNA) Young Artist National Competition. PLN: Have you studied or performed Schmitt’s other works for saxophone? 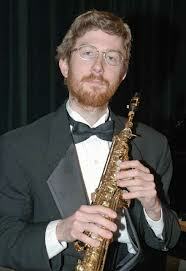 CB: Like many university-trained saxophonists, I have studied and performed Schmitt’s Saxophone Quartet. That work is clearly one of the core repertoire pieces for classical saxophone players. Recently, I’ve become interested in performing Schmitt’s Songe de Coppélius as well. PLN: What is your musical background, and what are you doing currently? CB: I joined the Department of Music faculty at California State University Fullerton not long ago, where I teach saxophone. I graduated from the University of Southern California where I earned the Doctor of Musical Arts degree. I studied with renowned Los Angeles Philharmonic saxophonist James Rötter, as well as jazz performance with Bob Mintzer. I hold a Master of Music degree from the University of Michigan, where I studied with Donald Sinta. I also have two Bachelor of Music degrees from Bowling Green State University in Saxophone Performance and Jazz Studies. There, I studied with John Sampen and Gunnar Mossblad. As for upcoming concerts, I have two concerto performances scheduled in the Los Angeles area and play solo recitals regularly at various venues. I will, of course, jump at any chance to perform the Légende again! Fortunately, we can hear Christopher Bartz’s prize-winning performance of Florent Schmitt’s Légende, courtesy of YouTube. Judging from the passion as well as the technical brilliance of his playing, here’s hoping that Christopher Bartz will have many more opportunities to showcase his very special interpretation of this “perilously seductive” music. This entry was posted in Chamber Music, Classical Music, Composers, French Composers and tagged Arno Bornkamp, Bob Mintzer, Christopher Bartz, Classical Music, Donald Sinta, Florent Schmitt, French Composers, Gunnar Mossblad, Hennings-Fischer, James Rotter, John Sampen, Legende, MTNA, Nones, Saxophone, Schmitt, Sharon Lavery, Steven Kerstein, USC, Villa-Lobos. Bookmark the permalink.